Please fill out the form below and all the information listed. Michigan campaign financing law requires that we obtain the information. We cannot accept cash. We can accept a check or other bank draft device which show the remitter information. Please indicate the required information (*) and mail to the address below. The donor’s occupation employer, and principle place of business (address of employer). If your contribution is $100.00 or less, please indicate “N.A.” in the donor’s occupation, employer, and address employers fields. While the campaign finds these fields to be offensive on their face, we remain committed to complying with all campaign finance regulations until elected and have the opportunity to change them. 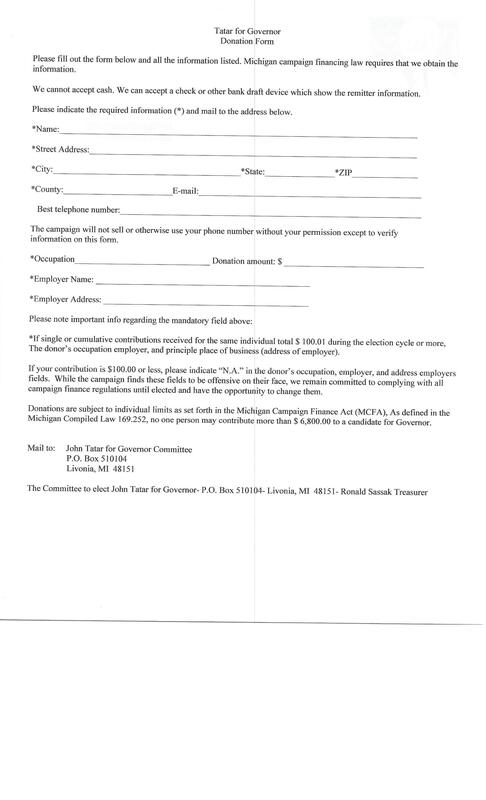 Donations are subject to individual limits as set forth in the Michigan Campaign Finance Act (MCFA), As defined in the Michigan Compiled Law 169.252, no one person may contribute more than $ 6,800.00 to a candidate for Governor.